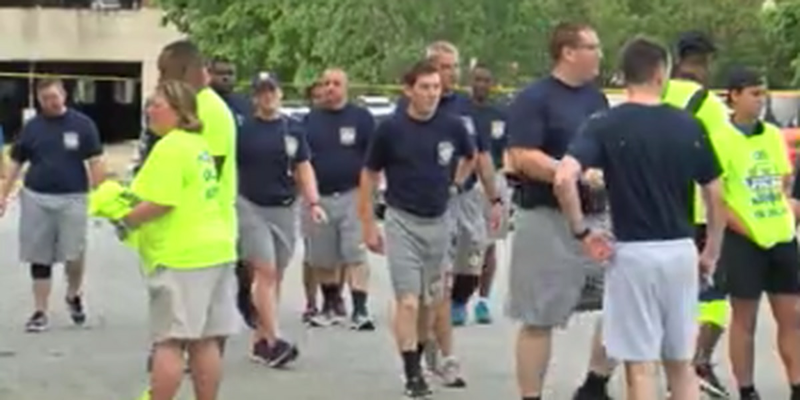 COLUMBUS, GA (WTVM) - The Fountain City's men and women in blue put on a different type of gear, lacing up their running shoes to raise money and awareness for the Georgia Special Olympics. "This is an excellent experience for law enforcement," said Cpl. Angela Florence of the Columbus Police Department. "[Us], the sheriffs [deputies], marshals - we support our communities. We want to make sure that athletes throughout the state have funds to be able to compete," she said. The Flame of Hope - carried this year by soldiers in Fort Benning - was passed on to dozens of officers, representing each of the various agencies in Muscogee County. The 35th annual Torch Run started at the public safety building at around 9 a.m., winding along 2nd Avenue and wrapping up at the Lake Oliver Marina. The officers even inspired young runners like 12-year-old Arnold Magnet Academy student Phillip Berni to do his and part and contribute to the cause. "I always love to run," Berni said. "The reason I want to run today is because I want to give back to my community." In 2017, CPD and its partners said they raised over $6,100; all of it, going toward providing year-round sports training and competition for children or adults with intellectual disabilities. This year's athletes welcomed the officers at the finish line at the marina entrance, cheering for and thanking them for their 30 plus years of support. As for matching last year's fundraising total this year, Cpl. Florence said, "We're hoping to exceed that." "There's just a sense of commitment, awareness and togetherness," she added. CPD also said it plans to host three more fundraising events meant specifically to help Georgia Special Olympics, including a pistol match, golf tournament and car show.